There is something mysterious about the musical archive. It holds a lot of promise. Where live performance – the way music was existed for millennia prior to physical medium – is immediate and experiential, media rendered to medium (physical, digital) can be visited at any moment. But it needs to be played. And so “the archive” becomes a place where sounds exist in limbo. A moment in time, frozen, waiting to be heard again. And that’s exactly why archives are so exciting. But after years of digging around in W. Africa, I’ve accumulated my own “new” archives, and many of the sounds have been moved from one limbo to another. Sometimes I’ve not yet had the time to go through them: entire collections of cassettes, copied en masse from a cassette vendor at a market stall; flash drives from radio stations, filled with mp3s, too daunted to look at. Most of the time, it’s because these musics form part of projects in nebulous states of completion. In 2014 I made a concentrated research to find the archives of the golden era of Niger music history. Often referred to as “musique moderne nigérienne,” it’s a recent genre born in the late 1970s. Niger “modern” came in the waves. The early or first generation of modern artists (Mona, Ali Djibo, Mamman Sani, El Hadj Taya) drew influence from Western rock and American soul. In the 1980s and 1990s a second wave of musicians appeared (Mamman Barka, Sani Aboussa, Sani Bori, and Adams Junior). These groups helped to create a specific Nigérienne sound, championed by contemporary groups like Tal National. 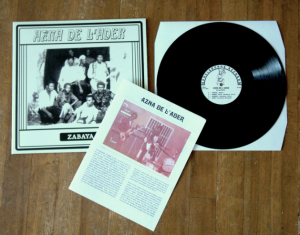 Azna de L’Ader, in its first incarnation, was a rock band. Mona took his cues from Western rock and was known throughout the region as the “Hendrix of the Sahara” (playing a fuzz face with tube amps), even performing in a purple frizzy jacket. Mona rarely performs these days. In the 1990s he stepped back from his solo work, and become the business and musical director of the band. About that time, Azna de L’Ader took a completely left turn. 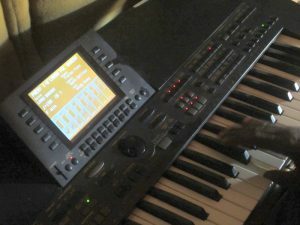 The 1990s Azna introduced synthesizer, a snapping decalé rythm, and spaced out vocal lines. The new Azna was less Hendrix and more electronic soukouss, a type of desert space disco. 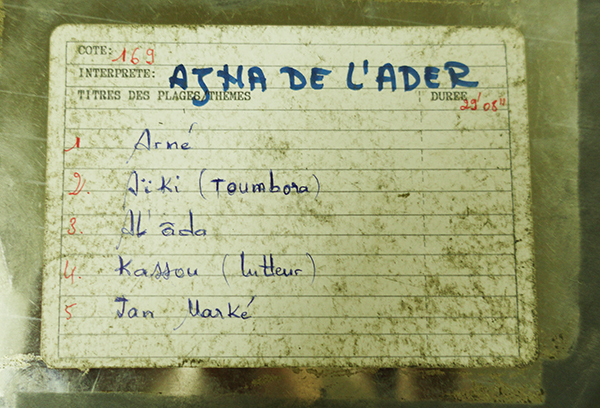 Azna de L’Ader never released any official albums, but I found a few reels of tape recorded at the National Radio in the late 80s/early 90s – too good to sit in another archive. Stay tuned for more. I am extremely happy to have found this site because I loved all the taxi songs when I was in Senegal. 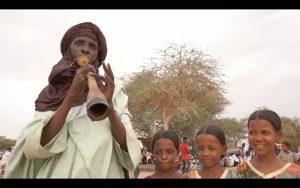 Looking forward to listen to more music from the Sahel. Wow, this is stunning!!! Thank you so much for sharing.